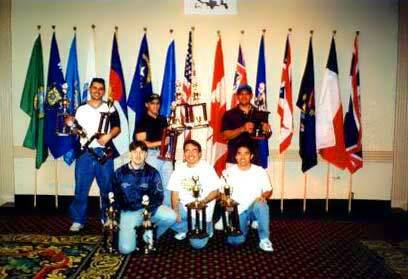 6/29/99 New photos from Gordon from 1999 USTSA Tornado Hall of Fame Classic in Las Vegas. From Distant Shores. . . Team Germany's Adnan Zagarevic and Patrick Knirim took home trophies for 2nd in Rookie Doubles and 2nd SemiPro Doubles. Team Hawaii's trophies are: Frankie & Peter 1st SemiPro Doubles, Frankie 2nd SemiPro Singles, Gordon and Ross 1st Rookie Doubles. See below for other placing finishes. Back Row L to R: (Adnan or Patrick), Frankie Balecha, Peter Algoso. Front Row: (Adnan or Patrick), Gordon Furuto, Ross Nagaji. Adnan, Peter, and Frankie all took home tables as the best rookies in Open Doubles (P & F), and Open Singles (A). Team Hawaii at Table 1. Ross Nagaji, Peter Algoso, Frankie Balecha, Clay Sato, DJ, Winston VanTreese, Gordon Furuto. Marv Puha and his Northern California doubles partner Bruce Van Buskirk. Marv & Bruce took 5/6th in SemiPro Doubles. Marv just moved to the Big Island of Hawaii, and is a former pro. Bruce is a San Jose, CA area promoter. Two of the coolest and nicest guys in foos. Team Germany's Patrick Knirim and Adnan Zagarevic. Trophies are for 2nd SemiPro Doubles and 2nd Rookie Doubles. 3/22/1999: Final results for top 50% placement in events for Team Hawaii. Total number of entrants is in parentheses. Some placements are ties among many teams because of the elimination format; these placements are listed as ties among many places, e.g. "5-6th" = a two-way tie for fifth place, and "65-81st" = seventeen-way tie for 65th. Prize-winning finishes are in boldface. If anyone has more pictures of the Hall of Fame Classic, lend them to me to scan & I'll put them up here. If you have any other stories to tell, I'll put them here too, like what did you think of Mainland foosball (rollovers, hacks, etc. ), and what about those tables for Frankie and Peter, are they paying for the shipping too??? And Layne, let's get photographs from USTSA of the winners with their trophies to put up in ZAPP! 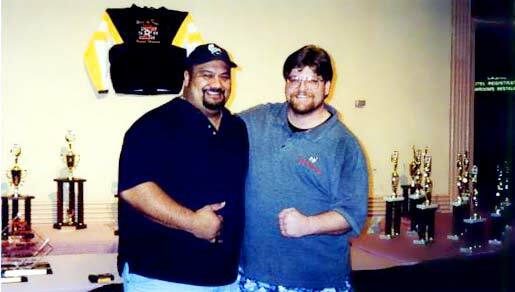 BTW Marv Puha, listed above, is formerly from here, and now resides Hilo, so I"ve listed his results. Maybe we'll see him once in a while on this island too... he's got that big open-hand pull-kick, among other shots (tic tac, saturday night razzle-dazzle), and is active in the SF/San Jose foosball scene. 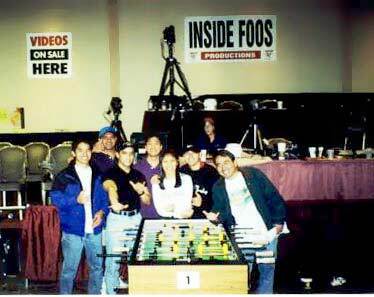 Wow, so Peter and Frankie each won a Tornado Timeplay Foosball Table as highest placing Rookie Team in Open Doubles! And Frankie is probably no longer listed as a rookie after winning all that! We'll see how everyone's points listing comes out next season. Hey Layne, how about we obtain the trophies/winners' photos from USTSA and frame them in ZAPP!? Kind of like championship banners in sports arenas! 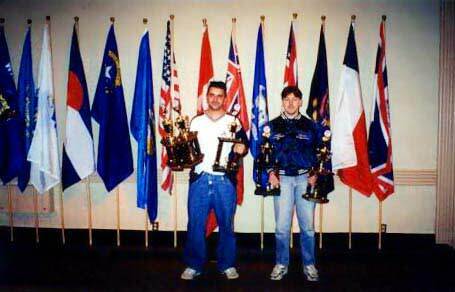 3/19/99: Ross was running his rollover for most of the tournament and they came straight through the winners' bracket, and defeated the German team with the intimidating European-style front-pin shot, which Gordon scoped out telegraphing earlier in the tournament; Gordon & Ross won in two straight, 5-1, 5-3! These German players were good enough to take 2nd in Semi-Pro doubles, behind Frankie & Peter, and one player (Adnan Zagarevic) also took third in Rookie Singles, and I think they also played Frankie & Peter again for the table playoffs, so they were very good too. Gordon Furuto (goalie) and Ross Nagaji (forward) on left. Adnan Zagarevic and Patrick Knirim on right. Gordon & Ross win 5-1, 5-3. 3/18/99: I'm waiting for official results, but I heard through the grapevine about several Hawaii wins. I heard first from Toki N. that Gordon Furuto & Ross Nagaji had won Rookie Doubles! I also found a photo of their finals matchup, and there they are on the left, Ross up front and Gordon on defense. Congratulations Team Hawaii!!! Great results for our first major outing! For now here's that photo, found at the Hall of Fame Classic home page.